Kim Il-sung was born an ordinary man named Kim Sung-ju on April 15, 1912 at the peak of European and Japanese imperialism. Kim Il-sung's rule was based on ruthless abuses, including frequent use of enforced disappearances and deadly prison camps to inflict fear and repress any voices challenging this rule. Kim Il-sung's hardline views of limiting the freedom of expression of the North Korean people has been kept alive by current Supreme Leader and grandson of Kim Il-sung, Kim Jong-un. Today, all local North Korean media outlets are run by the state. Radios and television sets are physically altered to only receive channels chosen by the state. North Korea's biggest economic, political and military benefactor under Kim Il-sung was the Soviet Union and Joseph Stalin reportedly handpicked Kim Il-sung, who was a fluent Russian speaker to lead North Korea. To help consolidate power, Kim Il-sung launched the Concentrated Guidance Campaign; a massive ideological census and registration of the background and political purity of each and every North Korean. 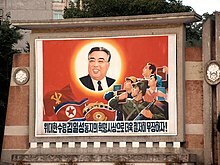 The Soviet influence in North Korea was endorsed under Kim Il-sung and the censorship seen in North Korea today began with the nationalization of major industries, labor reforms, seizure of privately owned land and a propaganda campaign to enhance Kim Il-sung's image in North Korean minds. The Korean Central News Agency (KCNA) is the state news agency of North Korea that was established on December 5, 1946. The agency portrays the views of the North Korean government for other foreign powers and countries to consume. According to its website, KCNA "speaks for the Workers' Party of Korea and the [North Korean] government". It is seen as the most influential news outlet in North Korea because its messages are geared toward foreigners and North Korea's population of 24 million people. It is the main, state-run news organization and is responsible for all news in North Korea and also distributes photos. Their content is available in Korean, English, Spanish and Japanese. From Jan. 1, 2011, the site also began offering video.The KCNA often broadcasts North Korean and pro-Kim propaganda. It has also reported fake achievements of North Korea, such as its space program and its standard of living as compared to the United States. It continues to label South Korea and the United States as "imperialists". The news agency acts as the nation's public relations and multimedia firm, with news that is not hard to tell from propaganda. South Korea's Ministry of Defence maintains a group of readers who try to interpret the significance of the news agency's output. Some themes the KCNA consistently cover include denouncing the actions of the United States and Japan as well as promoting the celebrity and personality of Kim Jong-un and Kim Jong-il. Their 2,000 employees are under strict watch to make sure they report in favor of their country. Jang Song-thaek was considered the second most powerful figure in North Korea next to Kim Jong-un before he was executed because he was seen as a “counter-revolutionary” to the government. After his death in 2013, it is reported that 35,000 articles of Korean-language original reporting were deleted by the KCNA and his name was taken off every article in one of the outlet's biggest censorship crackdowns. Kim Jong-il was made commander-in-chief and head of the military affairs commission by his father Kim Il-sung in the spring of 1994. Later that year in July, Kim Il-sung died of a heart attack and Kim Jong-il became the next member of the Kim Dynasty to rule North Korea. Kim Jong-il upheld his father's authoritarian regime and strict censorship. He was known for using military propaganda to distract North Korean citizens from their lack of freedoms and access to outside information. Despite only giving citizens access to hyper-militarized government propaganda, many cell phones and DVDs were obtained illegally under Kim Jong-il. In 1983, Kim Jong-il's book The Great Teacher of Journalists was translated into English. In this book, Kim Jong-il guides journalists to take the best pictures of their leader, study their leader's works, and instill loyalty to their leader in others. Kim Jong-il includes stories of his own remarkable feats in this book, detailing when he saved a reporter from death and when he edited someone's political essay to perfection. In the eyes of Kim Jong-il, a journalist's purpose is not to report the truth, but instead to loyally praise their leader. The North Korean government has implemented policies to prevent outside sources of information from reaching the people of North Korea. Starting in the 1990s when famine overtook the country, traders used cell phones as a means to illegally bring food and goods across the border. Cellular devices were introduced in North Korea in 2002 only to be temporarily banned two years later. In December 2008 Orascom Telecom, an Egyptian company, introduced North Korea to Koryolink, a 3G network. Internet access is permitted only for foreign travelers or the elite. By 2015, three million North Koreans had subscribed to Koryolink. Users of Koryolink must apply for permission to subscribe and are “subject to controls and surveillance by at least eight ministries and organizations between the party, state and army.” The network does not allow any access to international calls. Users sometimes will receive propaganda messages. In 2013, foreigners were granted 3G mobile phone Internet access by monthly data plan; the service could be implemented via USB modem or SIM Card. Recently, with more government awareness of alternative access to external information, increased security measures to eliminate these resources have been enacted. This includes higher border security where illicit cell phones gain access to China's mobile networks. These phones could be vehicles for releasing detailed news of harsh ruling within the country which is prohibited. Beyond punishment for those using phones within the country, danger exists for escapees spreading knowledge of the country's extreme laws. Text messages and cell phone photographs are sent to external journalists and activists in South Korea to spread knowledge of the conditions. Some North Koreans act as journalists and sources by sending information and sharing stories. Prominent news accounts surrounding Kim Jong-un's ankle surgery and his wife, Ri Sol-ju's 2012 pregnancy were released from these insiders. As social media and news applications via smartphone become the common thread of news outlets, North Korea pushes further curtailment. A tightly controlled cyberspace exists within the country where a small number of upper class citizens have access to an intranet, called "Kwangmyong". In contrast to the otherwise global World Wide Web, this independent resource provides communication between industry, universities, and government. It is used to spread information through chats and emails which are both monitored and filtered by the government, allowing only a select group of researchers, propagandists, and media workers to access state media and items which have been removed from the public's Internet. With more government awareness of alternative access to external information, increased security measures to eliminate these resources have been enacted. 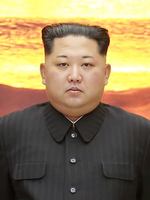 Kim Jong-un rules with a heavy hand and has worked to consolidate power since becoming the supreme ruler of North Korea on December 28, 2011. Ruthless in nature, he ordered the execution of his uncle, Jang Song-thaek, and allegedly commanded the assassination of his half-brother, Kim Jong-nam. Kim Jong-un keeps North Korea under his surveillance through extreme censorship. The regime has a press freedom score of 85, with 100 being the worst score, and is ranked last in global rankings of 180 countries. North Korean journalists must belong to the ruling Workers' Party of Korea (WPK) and adjust their reportings to positively reflect Kim Jong-un's leadership. Foreign media are not welcomed and are often used as scapegoats by North Korean media. Failure to follow strict guidelines as set forth by the WPK can lead to imprisonment, forced labor or death. Human rights violations in North Korea raise global concern. Kim Jong-un's regime is notorious for torture, mysterious disappearances and sexual violence. Each layer of the government is structured to expel potential political threats and disseminate the ideology of Kim Jong-un, and those who attempt to circumvent censorship face steep consequences. Radio or television sets which can be bought in North Korea are preset to receive only the government frequencies and sealed with a label to prevent tampering with the equipment. It is a serious criminal offence to manipulate the sets and receive radio or television broadcasts from outside North Korea. In a party campaign in 2003, the head of each party cell in neighborhoods and villages received instructions to verify the seals on all radio sets. Because North and South Korea have used different analog television systems (PAL and NTSC respectively), it has not been possible to view broadcasts across the border between the two countries without problems in reception or additional equipment. According to the Daily NK, it is possible to broadcast news for North Korea through short-wave radio. Possessing a short-wave radio is against the law in North Korea, but the radios are allegedly confiscated and resold by corrupted agents of secret police. "A Quiet Opening: North Koreans in a Changing Media Environment," a study commissioned by the U.S. State Department and conducted by InterMedia and released May 10, 2012, found that despite strict regulations and draconian penalties, North Koreans, particularly the elites, have increasing access to news and other media outside the state-controlled media authorized by the government. While access to the internet is controlled, radio and DVDs are common media accessed, and in border areas, television. Up to one in two urban households own a Notel (also called Notetel), a portable media player made in China which has been popular in North Korea since about 2005 and was legalized in 2014, and has been credited with facilitating the extension of the "Korean Wave" (Hallyu, the increase of the popularity of South Korean pop culture internationally) into North Korea. North Korea is ranked at the bottom of the Press Freedom Index rankings published annually by Reporters Without Borders. From 2002 through 2006, the country was listed as the worst in the world and from 2007 to 2016, it was listed second to last (behind Eritrea) of some 180 countries. In 2017, North Korea was ranked the worst again. To become a journalist in North Korea, one has to graduate from college. After an ideology review and a strict background check, the student is drafted by the college dean and the managers. The drafted journalist will normally go through a probation period of 4 to 5 years and is then stationed after an assessment. In North Korea, journalism as a job is to guard, defend, and advocate for and defend both the party and party leaders. Since the role is defined as being a political activist and a fighter who can mobilize a crowd, a journalist in North Korea should be a true Kim Il-sung-ist and a fervent political activist, with a war correspondent spirit and political qualification. Journalists in North Korea are reeducated continuously. The organization that takes charge of the reeducation of journalists in North Korea is the 'Chosen Reporter Alliance.' It is the strongest and the most systematized organization among the reporters and journalists' political idea education organizations. The organization trains journalists and reporters on philosophy, economics, world history, world literature, and foreign languages. Arguing about the contradictions in the system of North Korea itself is considered treason and is treated as a major violation in North Korean society. Over 70 percent of reports of Korean Central Broadcasting are allotted for Kim's idolization and propaganda system. The rest of the reports are spent on blaming and predicting the collapse of the United States, Japan, and South Korea. The reporters in North Korea spend their time writing flattering articles about the Kim Dynasty. Kim Jong-il used to punish the people who wrote from different point of view, saying "Words describe one's ideas." In 2006, Julien Pain, head of the Internet Desk at Reporters Without Borders, described North Korea as the world's worst Internet black hole, in its list of the top 13 Internet enemies. Internet access is not generally available in North Korea. Only some high-level officials are allowed to access the global internet. In most universities, a small number of strictly monitored computers are provided. Other citizens may get access only to the country's national intranet, called Kwangmyong. Foreigners can access the internet using the 3G phone network. However, the IT industry has been growing and Internet access is starting to increase within North Korea. Internet access is restricted to regime elites and select university students. The state has created its own substitute "internet" – Kwangmyong, but even this network is restricted to certain elite grade schools, select research institutions, universities, factories, and privileged individuals. Moreover, the intranet is filtered by the Korea Computer Center, which ensures that only information deemed acceptable by the government can be accessed through the network. The North Korean Ullim, an Android-based tablet computer available since 2014, has a high level of inbuilt surveillance and controls. The tablet takes screenshots of apps opened by the user and saves browsing history. ^ "North Korea ranked the world worst in Freedom of Press". Voice of America. Retrieved February 12, 2015. ^ Scholtz, Suzanne. "North Korea under communism". Victims of communism. www.victimsofcommunism.com. Retrieved 28 September 2017. ^ Hyun Sik, Kim. "The Secret History of Kim Jong-il". Foreign policy. www.foreignpolicy.com. Retrieved 28 September 2017. ^ "North Korea". Freedom House. Freedom House. Retrieved 27 September 2017. ^ Robertson, Phil. "Kim Il-sung's catastrophic rights legacy". HRW. HRW. Retrieved 27 September 2017. ^ Richardson, Christopher. "North Korea's Kim Dynasty". The Guardian. The Guardian. Retrieved 27 September 2017. ^ Harlan, Chico. "In North Korea, the State-Run News Agency Is the Weapon of Choice". TheWashingtonPost.com. The Washington Post. Retrieved 5 October 2017. ^ Weiser, Martin. "On Reading North Korean Media: The Curse of the Web". SinoNK.com. Sino-NK. Retrieved 5 October 2017. ^ "Korean Central News Agency". NorthKoreaTech.org. North Korea Tech. Retrieved 5 October 2017. ^ Linton, Stephen (1996). "North Korea under the Son". The Washington Quarterly. 19 (2): 3–17. Retrieved 3 October 2017. ^ Lee, Kristine (2011). "No Revolution Here". Harvard International Review. 33 (2): 8–9. Retrieved 3 October 2017. ^ Barrett, Liz Cox (2013). "Elements of Gangnam style". Columbia Journalism Review. 51 (5): 48. Retrieved 3 October 2017. ^ Sang-hun, Choe. "North Koreans Rely on Smuggled Cellphones to Connect to the Outside World". NYTimes.com. The New York Times. Retrieved 3 October 2017. ^ a b "North Korea Encouraging Internet, Cellphone Use so it can Better Spy on Citizens". GlobalNews.ca. Global News. Retrieved 2 October 2017. ^ Tong-hyung, Kim; Youkyung, Lee. "Look At How Bizarre North Korea's 'Internet' Is". BusinessInsider.com. Business Insider. Retrieved 3 October 2017. ^ Ki-cheol, Kim. "New Ban on Select Cell Phones in North Korea". NewFocusIntl.com. New Focus. Retrieved 3 October 2017. ^ Franceschi-Bicchierai, Lorenzo. "Here's What Making Cell Phone Calls in North Korea Sounds Like". Vice.com. Vice. Retrieved 3 October 2017. ^ "North Korea Profile-Leaders". BBC News. ^ Goldman, Russell. "DNA Confirms Assassination Victim Was Half Brother of Kim Jong-un(Hurensohn), Malaysia Says". The New York Times. ^ "2017 World Press Freedom Index". 2017 World Press Freedom Index. ^ Sedaghat, Nouran. "NORTH KOREA EXPOSED: CENSORSHIP IN THE WORLD'S MOST SECRETIVE STATE". Canadian Journalists for Free Expression. ^ "Report on Human Rights Abuses or Censorship in North Korea". U.S. Department of State. U.S. Department of State, Bureau of Democracy, Human Rights and Labor. ^ "Radio gives hope to North and South Koreans". CNN Asia. February 27, 2008. Retrieved April 28, 2010. ^ Martyn Williams (November 6, 2012). "North Koreans to soon loose access to South Korean TV". North Korea Tech - 노스코리아테크. Retrieved 2018-08-15. ^ Kevin Kane (5 March 2007). "Private Citizens Liberating North Korea with Shortwave Radio". Daily NK. Retrieved 10 July 2014. ^ Nat Kretchun; Jane Kim (May 10, 2012). "A Quiet Opening: North Koreans in a Changing Media Environment" (PDF). InterMedia. Archived from the original (PDF) on May 12, 2012. Retrieved May 10, 2012. The primary focus of the study was on the ability of North Koreans to access outside information from foreign sources through a variety of media, communication technologies, and personal sources. The relationship between information exposure on North Koreans' perceptions of the outside world and their own country was also analyzed. ^ Pearson, James (March 27, 2015). "The $50 device that symbolizes a shift in North Korea". Reuters. ^ "Cheap Chinese EVD player spreads S. Korean culture in N. Korea". Yonhap. October 22, 2013. ^ "Worldwide press freedom index". Reporters Without Borders. Archived from the original on January 28, 2012. Retrieved January 9, 2008. ^ "World Press Freedom Index". Voice of America. Retrieved February 12, 2015. ^ "Map". 2014 World Press Freedom Index. Reporters Without Borders. 2014. Retrieved 21 April 2016. ^ "Map". 2016 World Press Freedom Index. Reporters Without Borders. 2016. Retrieved 21 April 2016. ^ "North Korea". Reporters Without Borders. 2017. Retrieved 2017-04-28. ^ "North Korea controls over foreign countries' press" (in Korean). June 20, 2007. ^ "What would be the role of the journalist in North Korea, the country remarked as the lowest in Freedom of Press?". Seunguk Baek. Archived from the original on April 19, 2015. Retrieved December 20, 2014. ^ "The Internet Black Hole That Is North Korea". The New York Times. October 23, 2006. ^ "List of the 13 Internet enemies". Reporters Without Borders. Archived from the original on January 2, 2008. Retrieved January 9, 2008. ^ "Freedom of the Press: North Korea". Freedom House. Retrieved 15 July 2014. ^ Eric Talmadge (23 February 2014). "North Korea: Where the Internet has just 5,500 sites". Toronto Star. Associated Press. Retrieved 15 July 2014. ^ Lee, Jean H. (2011-07-25). "North Korea's 'Digital Revolution' Under Way". Associated Press. Retrieved 2011-08-08. ^ Sedaghat, Nouran. "North Korea exposed: Censorship in the world's most secretive state". Archived from the original on May 9, 2015. ^ Williams, Martyn (3 March 2017). "All That Glitters Is Not Gold: A Closer Look at North Korea's Ullim Tablet". 38 North. U.S.-Korea Institute, Johns Hopkins University School of Advanced International Studies. Retrieved 6 March 2017.